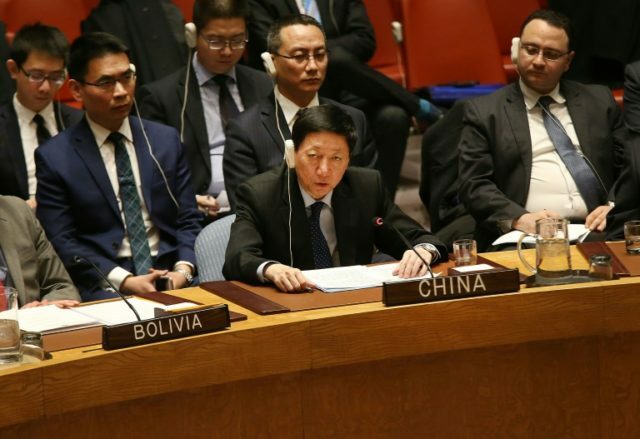 United Nations (United States) (AFP) – China has put a hold on a US request at the United Nations to ban 33 ships from ports worldwide and blacklist 27 shipping firms for helping North Korea circumvent sanctions, according to a document seen by AFP on Monday. The United States presented the request on February 23 to a UN sanctions committee as part of a crackdown on smuggling of North Korean commodities, in violation of UN sanctions resolutions. China on Friday “placed a hold on the proposals” from the United States, said the Dutch chair of the sanctions committee in a letter seen by AFP. US diplomats said they were waiting for a further explanation from China and the rest of the sanctions committee before considering the next steps. The US request at the United Nations coincides with President Donald Trump’s announcement last month of the “heaviest sanctions ever” on North Korea over its nuclear and ballistic missile tests. The request lists 33 vessels – 19 of which are from North Korea– that would be barred from entering all ports worldwide. Japan joined the United States in supporting the request concerning three of the 33 vessels for carrying out ship-to-ship transfers of oil destined for North Korea. The three tankers are the Dominica-flagged Yuk Tung, Belize’s Wan Heng 11 and the North Korean tanker Yu Jong 2. The US request also targets a national from Taiwan, Tsang Yung Yuan, who is said to be coordinating illegal North Korean coal exports with a North Korean broker in Russia. Of the 27 shipping and trading firms facing a UN assets freeze, five are based in Hong Kong including Huaxin Shipping, which has allegedly used its vessel to deliver North Korean coal to Vietnam. Two other companies — Shanghai Dongfeng Shipping and Weihai World Shipping Freight — also based in China, are cited for carrying North Korean coal on their vessels. Last year, the Security Council adopted a series of resolutions to ban North Korean exports of commodities in a bid to cut off revenue to North Korea’s military programs. The United States and Japan are strong backers of sanctions as a way to pressure Pyongyang to come to the negotiating table and end its drive to develop nuclear weapons.